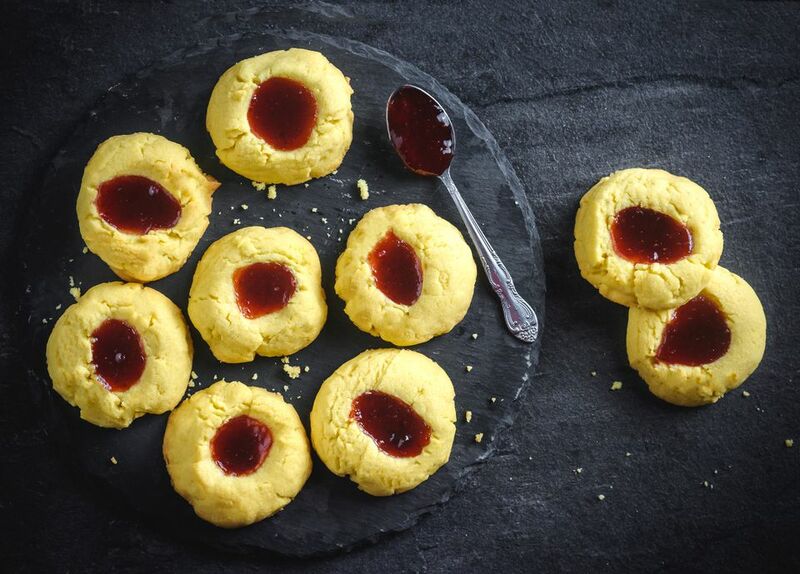 This recipe for Polish butter cookies, or ciasteczka maślane z dżemem (chahss-TETCH-kah mahsh-LAH-neh z JEM-em), is a simple treat filled with jam (strawberry is preferred) in the middle. It's popular year-round, but especially for Christmas. Gather the ingredients. Preheat the oven to 350 F.
Beat in the egg yolks and vanilla until well mixed. Add the flour, baking powder, and salt and beat at low speed until thoroughly mixed. If the dough is too soft, wrap in plastic and chill 1 hour. Use a small scoop to portion out cookies onto parchment-lined baking sheets. Use the end of a wooden spoon or a finger dipped in flour to make a depression in the center of each cookie. Fill with about 1/2 teaspoon strawberry jam. Bake 8 to 10 minutes or until lightly browned around the edges. You will use the yolks only of two eggs, so try using the leftover egg whites for another treat like meringue torte.